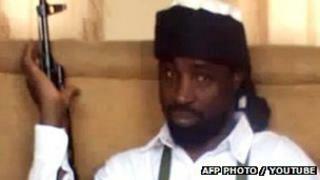 Three leaders of Nigeria's Boko Haram Islamist group have been designated as terrorists by the US state department. Abubakar Shekau leads the militant group, while Abubakar Adam Kambar and Khalid el Barnawi are thought to have ties with a branch of al-Qaeda. The move means any assets belonging to the men in the US will be frozen, and contact with US citizens banned. Boko Haram has said it carried out a number of attacks against churches and other establishments since 2009. More than 640 people have died in the country so far in 2012 in attacks blamed on the group. The BBC's Kim Ghattas, in Washington, said the move was likely to have little effect on the three men. She said it was more of an attempt to help stop sectarian violence in the country. Boko Haram carried out a series of attacks against churches on Sunday, sparking a wave of sectarian reprisals. Gun battles also broke out in Damaturu after attacks by the group against security forces. Boko Haram, whose name means "Western education is a sacrilege" in the Hausa language, is based in the dominantly Muslim north of Nigeria. The south of the oil rich country is mostly Christian. It is thought some members of Boko Harem have connections with al-Qaeda in the Islamic Maghreb, a group already designated as a terrorist organisation by the US.